At the top I have added a new category called Children’s E books. There is one book up there now that is available for purchase. 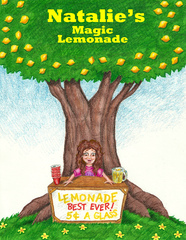 It’s a children’s story called Natalie’s magic lemonade. It a cute story about a girl and a lemon tree that she grew from a seed. Contains full color pictures in the story. Hopefully I will be adding more children’s E books up there in the near future. If there is anyone who has a children’s ebook that would like to be listed, contact me and I will let you know how to go about it. Meanwhile, if interested you can check out this story.